#Dortmund vs #BayernMunich is about to start. There are 8.074396 Bitcoin Matched. There are 13.67401 Bitcoin Matched. #Crewe vs #Bolton is about to start. There are 4.256 Bitcoin Matched. interested in learning more about how the rollover works on the bonus.. thanks! 1. I provide liquidity on the Over 2,5 market of Arsenal vs. Leicester. Later someone places a bet into my offer. Therefore I do not pay any commission if my bet wins (Maker bet). 2. I take liquidity on another market of the same Arsenal vs. Leicester match (e.g. Over 4,5 Goals) by simply placing a bet into an available offer. Therefore I pay 4 % commission on my net winnings. Did I make a mistake in my example? Do I have to pay 4 % commission on both winning bets, because one of them was a Taker Bet? I´m unsure how your fee structure plays out in a scenario like my example where I have different bet types (one Maker Bet, one Taker bet) on different markets of the same match. it's quiet complicated. I wondor how I bet on your game. #Arsenal vs #LeicesterCity is about to start. There are 6.907424 Bitcoin Matched. Even if you have won on the first you wouldn't be charged anymore regarding that because all your bets were bet makers. Anyone interested in making automated profits arbitraging bets between BetBTC and Fairlay? Both platforms support and promote arbers and winners! Express interest now while the price of admission is still $0! #ManUtd vs #WestHam is about to start. There are 5.73944 Bitcoin Matched. Mayweather Jr v McGregor the big fight is almost here. We had to make a few tweaks on the firewall and that's why the webserver went down a couple of times. But, just to inform that the problem persists to me. The site is still down. I can only access it through a VPN. I can't make withdrawals. No one has responded to my email I sent over 24 hours ago. Can you give us updates about the situation and answer emails? Are you sure you can access it with a VPN? 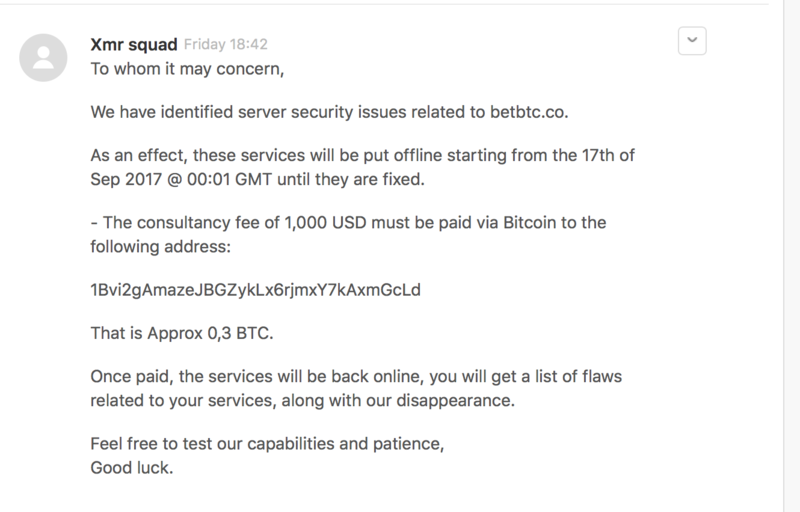 According to Cloudflare the problem is with BetBTC and not with Cloudflare. Therefore I find it highly unlikely that you are able to access the website with a VPN, if the server is down. I can definitely access it with a VPN. They are updating the front page with new sports matches everyday and they have users online according to their counter, which constantly changes. I can access the site now even without a VPN. I strongly suspect that they are still subject to a DDoS attack. Let´s hope they manage to sort these issues out.